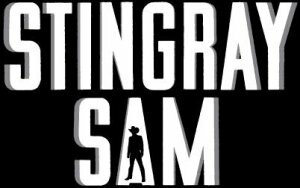 Cory McAbee is back with STINGRAY SAM! I'd have to agree with our friend Kurt over at Twitch, McAbee's first flick American Astronaut is one fine film and it would easily fit into my top 100 favorites of all time. Now for those who've been following, Cory had been trying to make another musical called Werewolf Hunters of the Midwest but unfortunately funding fell through leaving us cult fans high and dry. But now, good news! Cory's working on some type of serialized film which looks like it's going to be a feature premiering at Sundance called Stingray Sam and from the trailer and photos it looks like another winner! "A dangerous mission reunites Stingray Sam with his long lost accomplice, The Quasar Kid. Follow these two space-convicts as they earn their freedom in exchange for the rescue of a young girl who is being held captive by the genetically designed figurehead of a very wealthy planet. This musical space-western miniseries is designed for small screens and perfect for screens of all sizes." You can find the trailer on the official website. Thanks so much for the info. I too have been eagerly awaiting "Werewolf Hunters of the Midwest" and was sorry to hear that it probably wouldn't be happening. Here's hoping this project gets McAbee and the rest of the BNS gang the capital/recognition they need to push their next project forward.